There is a debate currently going on between the “clean eating” people and the “IIFYM” people. What does IIFYM stand for? It stands for If It Fits Your Macros. The clean eating people have made the claim that the IIFYM people believe you can eat junk all the time and still lose fat. My thoughts on this are really simple. To me being intellectually honest is extremely important when having a debate of this sort. Neither side should be allowed to make claims they know are untrue. If either side is allowed to get away with intellectual dishonesty then the entire debate is rendered useless. 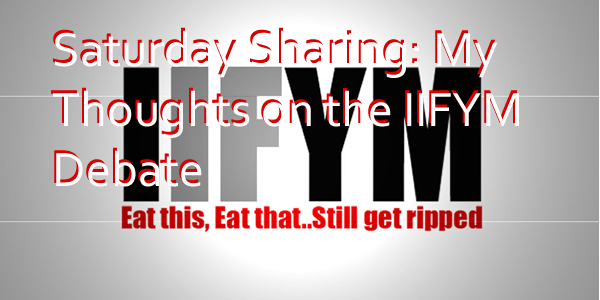 It is simply not true that the IIFYM people preach eating anything you want at all times. There are guidelines. It is referred to as flexible eating for a reason–it provides flexibility. The guidelines say you should be eating healthy food 80% of the time. As discussed in a past episode of my Expose Podcast, a calorie really is a calorie, but in order to be healthy you must eat healthy a certain percentage of the time. If all you did was eat doughnuts all the time you would soon be feeling fairly ill. The flexible eating approach is quite important to someone trying to lose fat. By allowing them to participate in normal activities like parties it helps them stay on the nutrition plan. It enables them to eat with their family as long as they watch their macros. It works. I've been using it for just 4 weeks and I have already lost 3% body fat. That's about the same as when I did strict clean eating, yet without the discomfort. I think everyone should be honest. Both ways get results. One way may just simply work better for some than the other way. That is all good. People should use the approach that is best for their situation. It is just like the answer to the age old question “At what time of day should I train?” The answer is “You train at the time you will get it done consistently.” Whether you use clean eating or IIFYM, the key is to use the system that you will stick to consistently.